Worried about mold in your property? Mold growth can cause a lot of problems, up to and including serious illness. For this reason, any mold growth should be treated with the utmost seriousness. If mold is growing in your home or business, you’ll want the expert and safe services of Skyline DKI’s mold remediation crews! Because it can grow in hidden places behind walls and in ceilings, mold is often very difficult to detect without professional assistance. If your home has recently experienced water damage—or if you have any reason to suspect mold growth on your property—call Skyline for fast and efficient assessment and mold removal services. 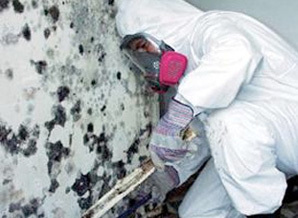 Our remediation crew will work quickly to completely eliminate the mold growth from your home. They will also find the source of the problem—most likely water damage—and fix it too. Home and business owners throughout Chicago and Milwaukee can trust Skyline DKI for all their mold removal needs! Q: What are the health risks of mold growth? The most common symptom of mold exposure is an allergic reaction, usually affecting the upper respiratory system (including congestion, a sore throat, itchy eyes, a runny nose, etc.) Prolonged exposure to toxic molds, including black mold, can lead to life-threatening health issues—some of the most common symptoms of toxic mold are severe headaches, confused thinking, and dizziness. Q: How can I tell if mold is growing in my home? Here are a few signs you can look for that may mean that mold is growing in your home: A musty/damp odor, water stains or water damage, and visible mold growth on walls, ceilings, or floors. If you see any of these, call Skyline DKI for professional mold assessment and remediation. Q: How can I tell if it’s a dangerous mold? Not all mold growth is dangerous, but since it’s often impossible to tell the different molds apart without testing you’ll want to call a professional mold assessment team. If the mold is determined to be dangerous, we’ll work quickly to contain it and to keep it from spreading any further.